On Friday night England will hope to continue their march towards the 2018 FIFA World Cup when they travel to Malta, who have lost all six qualifiers to date. We take you through our Malta v England match preview and betting tips for the fixture at the Maltese National Stadium in Ta’ Qali. This will be the 5th clash between these two sides, with the Three Lions having won all four of the previous fixtures. Somewhat surprisingly, two of those wins have been by a single goal while the meeting at Wembley earlier in the campaign finished 2-0 to the hosts. England’s last trip to Malta came in 2000, when goals from Martin Keown and Emile Heskey secured a 2-1 victory. England are undefeated so far in the qualification group but draws in Slovenia and Scotland (highlights below) ensure they are not in full control of their group – only two points clear of Slovakia and three of the Slovenians. The Three Lions have not lost any of their last 17 qualification matches for the World Cup, dating back to a 1-0 defeat in Ukraine in October 2009 – they’ve won 11 games since. Somewhat ironically, Malta picked up a notable 1-0 victory in Ukraine in a friendly in June. However, the Maltese have lost each of their last 10 World Cup qualification matches and have only ever won two qualification games in 98 attempts! Both those victories came away from home, in Estonia and Armenia. Everton’s goalkeeper Jordan Pickford, who is uncapped, has withdrawn from the England squad due to a muscular injury, with Joe Hart, Jack Butland and Tom Heaton the other shot-stoppers in the squad. Leicester’s Harry Maguire and Watford’s Nathaniel Chalobah are the other two uncapped players in Gareth Southgate’s squad. Defenders Aaron Cresswell, Kieran Trippier and Michael Keane have only five caps between them and all are vying for starts. Malta’s most well-known player is former Coventry City striker Michael Mifsud, who has 40 international goals in 127 caps. There are two English-based players in their squad: defender Sam Magri (Ebbsfleet United) and Luton midfielder Luke Gambin. 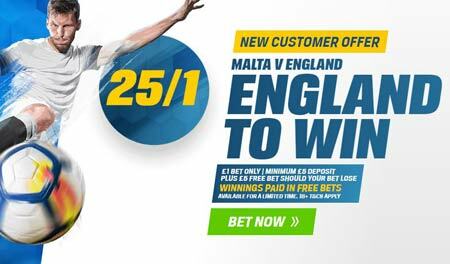 England are massive favourites for this clash and with good reason – Malta’s squad is semi-professional and their qualifying record is horrific. Anything less than three points for the visitors would be a hugely concerning result and potentially derail their apparent seamless qualification to football’s most famed tournament. However, there is genuine value in believing their inevitable victory will only come by a goal or two, with Southgate’ side keeping a clean sheet. England have failed to score more than two goals in three of the sides previous four clashes including last year’s meeting at Wembley. The hosts will sit back and be compact, attempting to keep the score as low as possible with England likely to settle for a low-scoring victory.